My role-playing game is the setting of my first real creative writing, which was "Danica". Most of my work as Dark is likewise set in this world. 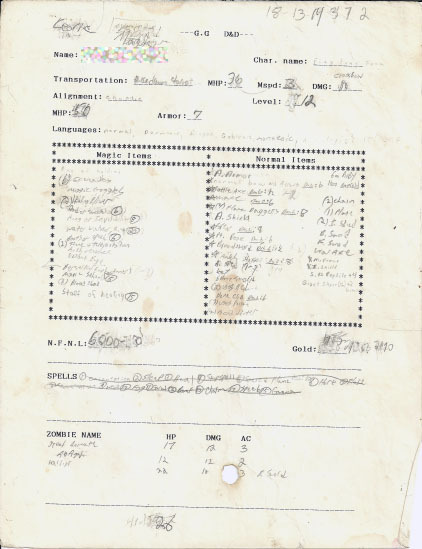 Long before I was an amateur author, I was an amateur Dungeonmaster. In this section of the "About" page, I'll reveal some details of the game that is the origin of my fantasy world. Along the way, I'll post pictures of material from the game, and relate it to the characters and settings you'll read about in my stories. My introduction to role-playing and fantasy settings came from two places: An NES game called "Dragon Warrior" and a Taito arcade game called "Gladiator". To this day, I still haven't read some of the classics of fantasy literature such as Tolkien, which I'm sure surprises many. First, I created a game on paper that was essentially Gladiator. I was the only one who played this game, which was primarily for me to pass the time in study hall and to expand on a game I loved with new levels and traps. It was as much a memory game as anything. My introduction to Dungeons & Dragons was brief, but influencial. A friend at school asked me to create a player and play a game with him during one of the lazy days at school just before a holiday break, when nothing other than parties were actually going on in each class. He ran it more or less as a choose-your-path adventure with no dice, and I didn't last long, falling into a trap and dying. Even without the books, dice, or other trappings, it gave me a basic idea of what a PnP role-playing game was. From this, I began creating my own game, using what little I'd picked up during that session and merging in elements of Dragon Warrior to round it out. 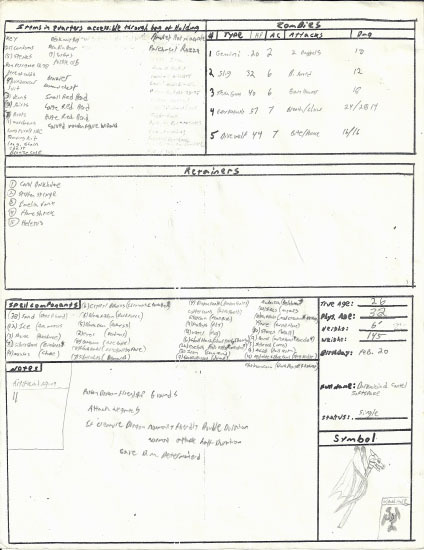 The Character sheets were typed up on a Brother word processor, which was essentially a typewriter that gave you the ability to use fonts and backspace before committing anything to paper. 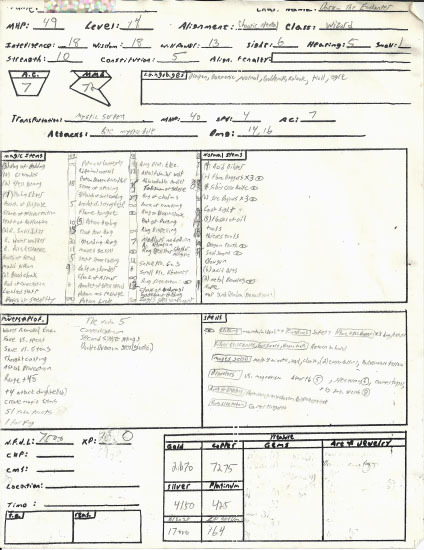 Below is a screenshot of one of the earliest character sheets ( the first were handwritten ) from my brother's character, Fing Fang Foom - complete with cigarette burn! I designed the game to run off normal six-sided dice, since I didn't even know that specialized multi-sided dice existed. I tried out this game with my brother and cousin at a family gathering, and they quite enjoyed it. So, I moved on to including my friends from the neighborhood, to rousing success. Everyone wanted to play the game all the time. All of the characters at first were Dragon Warrior style warriors who could cast magical spells. The first major modification to the game was when I created a new class - pure wizards who used magic as their primary offensive and defensive weapons. The very first test character for this new class was my namesake - Darkniciad. His name comes from a character in the Marvel Universe called Damikh the Enchanter. I changed it a little, expanded his name with some random, cool-sounding archaic syllables, and he was ready to roll. Everyone had multiple characters, and we just played whichever one fit our mood whenever we sat down at our custom-built plywood and 2x4 gaming table. After wizards came clerics, then the classes exploded to include everything from ninjas to demons and drow elves. 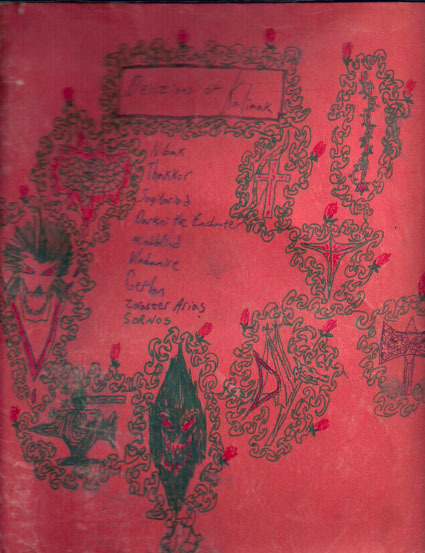 Here's an image of my character folder that I used for most of my characters, as best as I could scan it. The two names you see that have never made an appearance in my stories were Nibak the Minotaur and Sornos the Elf. They were some of the last characters I rolled up, and never got all that much play time. Since I hadn't developed them as much, they didn't make it into my world. Devan was what we called a "retainer". They were player characters, but the Gamemaster had a little control over them. That's why she's not named on the folder. 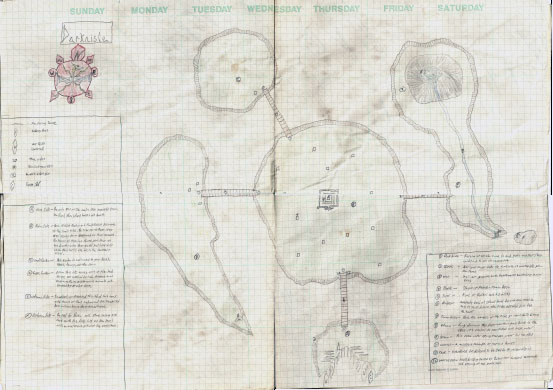 The above scan is of a map that's four 8 1/2" X 11" pieces of graph paper taped together. Now, imagine that the central continent of Ostfallin ( which is where almost all the locations you know from my writing are ) was comprised of eight different maps of equal size. 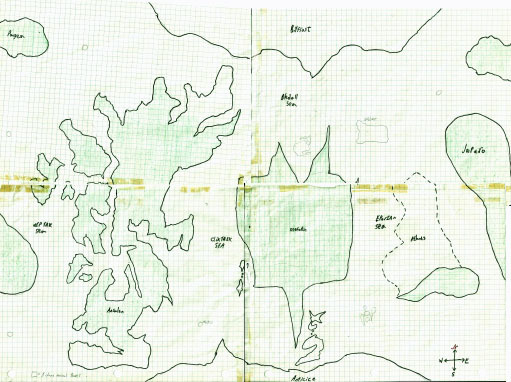 And naturally, there were even more detailed maps of nations, cities, and even individual castles. I did a lot of mapping, and there were infinite locations to explore, because I was always creating new ones. You'll also notice Ansalon on the map. I put the main continent of the Dragonlance world directly onto my map. I just melded my world ( which was originally only the central continent ) with Krynn and created more continents over time. Some of the characters were actually part of the world, though nobody ever had the opportunity to meet Raistlin, Tasslehoff, and the rest. Satchel of Hasty Departure(opens in a new window) converted to 4th Edition AD&D rules. I'll add more as I have time to scan things, remember stories, or suggestions come in. I decided I wanted to get the About page live and on the site for now.